\r\nIO-360, WW200RV C/S prop, prop spacer, extended James cowl, Tip-up, oversized 380-150/5 tires. Simple glass panel, CAD sportsman seats and carpet, painted and full fairings. \r\nNo paint, all fairings, full interior, SJ cowl & plenum. 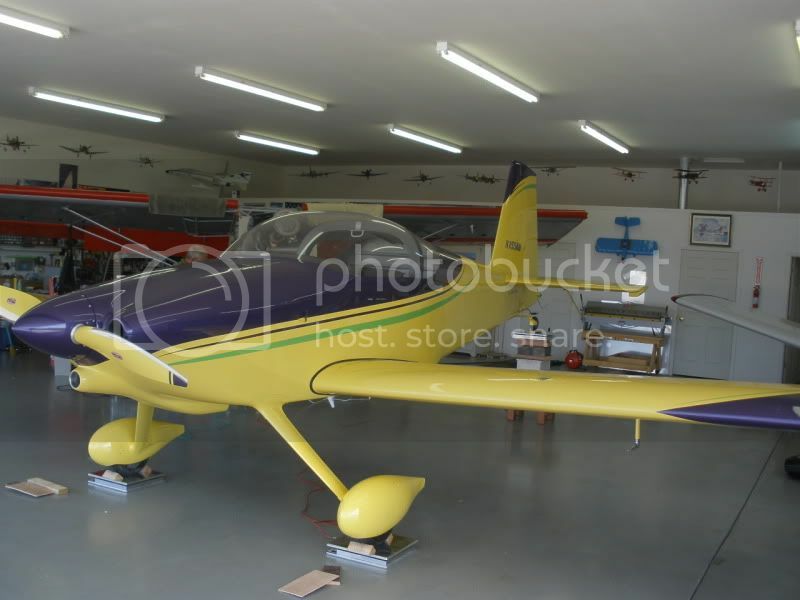 \r\nRV-7, 5 yr build, flew it 68 hours, sold it, miss it. \r\nDual Dynons, dual battery backup, not much else. No interior except seats and no paint. \nSlider closed, catto 3 blade with saber spacer, carb 0360, paint and pants, classic aero seats and carpet. ( no side panels yet ) with engine oil, no fuel. \nI do have a problem. When I get on the step to get in , the tail goes down. Lucky someone was at the prop and got a hold of it for me. I understand that when I put some fuel in, that it will help. Im going to have to look at how to fix this. \r\nWhat are my options to put more weight up front ? Im after best bang for buck, I dont want to have to go to CS prop. I think I can get a Landol CG ring for around $450, I already have a heavy starter. \r\nHow about some lead bolted to the engine ? \r\nThe aft limit of the RV-7A is 86.82". \r\nIf I put 30 gallons of fuel in the tanks with nothing else loaded, the CG is at 80.74. Yours is at 81.7, about an inch aft of mine. \r\nMy weights came in at 417, 412, and 244 up front. What are your weights? \r\nI am somewhat restricted in carrying baggage with more than 400# in the seats plus the CG moves aft as fuel is burned off. Its easy to take off in limit and land out of limit. \r\nYou will be restricted also but you should be able to fly the test flights while you come up with a way to add some weight up front. With 30 gallons of fuel and a 200# pilot, I calculate your cg will be at 84.04 well forward of the 86.82 limit. Landing with 10 gallons of fuel, the cg will be at 84.31. \nThe problem I have is this. 1 x (about 250 lbs) co-pilot seated, 3/4 full fuel, slider canopy open, when the other pilot ( about 200 lbs ) got on the step and tried to get onto the wing, the tail hit the ground. \nNote this was with the engine cowls top and bottom off, no wheel pants. Even when I did have them on, it still feels AFT CofG. \r\nThe 360 engine mount seems to have been designed for a C/S prop. For those of us who like the idea of a Catto prop, we should be using the 320 mount even with the 360. \r\nthere is very little difference in weight between a 320 and 360. Doesn\'t a light prop move the CG towards the rear? \r\nN526RV RV7A Tip Up, IO360 180 W/Hartzel BA prop. \nI\'m not sure what the length difference between the 320 and 360 mounts are but I do know the mount I had with the 290 was 12" from the firewall. The mount I now have with the 360 is only 10" from the firewall. \nGranted my -9 is different than the -7 but the O-360 and Catto prop with the 10" mount work out great! \r\nECI IO-360 180 hp with 3 blade Catto, simple panel, night vfr with MGL Enigma EFIS, no interior except cloth covered seats and some blue foam with carpet on the floor between the ribs. \r\nHowever, this is after adding a 20lb Saber Mfg steel crush plate and longer bolts. With the 1 pound aluminum crush plate, I was at 1056lbs and 82.37 C.G., which only gave me 32lbs of baggage capacity. Adding 20lbs to the nose added 18lbs to the rear baggage capacity at landing weight with an hour of fuel reserves. \r\nFor Oshkosh, I strapped tools and tiedowns under my co-pilots legs, and velcro\'d a plastic box in front of the fuel pump for spare oil and canopy cleaner, thus putting some of the cargo weight in front of CG. \r\n"A pilot just bides his time until his plane can take him away again, into the air"
too late at night. A light prop absolutely moves CG aft. The 320 mount moves the engine,flywheel and prop forward, therefore moving the CG forward. \r\nI hope I stated it correctly this time. \r\n32HRS ON PLANE NOW AND IT FLYS STRAIGHT AS AN ARROW! \r\nIt also is very predictable in stalls with a short buffet before it breaks. \r\nThe problem I have is this. 1 x (about 250 lbs) co-pilot seated, 3/4 full fuel, slider canopy open, when the other pilot ( about 200 lbs ) got on the step and tried to get onto the wing, the tail hit the ground. \r\nNote this was with the engine cowls top and bottom off, no wheel pants. Even when I did have them on, it still feels AFT CofG. \r\nI just got off the phone with Sam at Saber intending to get some info on the device he has to help fix your situation and he asked if I was calling on behalf of Jamie in Australia and I said yes. You are one step ahead and have already contacted him. \r\nThat 14# crush plate would cure your problem. The only issue is how much it would cost to get it to you. \r\nI hope this should help with my aft CofG. I hope to get it fitted in the next day or so, and will also be getting a prop balance done. I will post my findings then. \r\nflying with almost 2,000 on the hobbs! Chad, what engine, prop,and anything else special equipped. This helps with others trying to figure out how there\'s may balance. \r\nWhen I load two pilots and full fuel I can only get 42 pounds of baggage before I\'m outside the aft cg limits. Anyone have any ideas on how to move the cg a little farther forward at the empty weight so I can carry more baggage? \r\n	RV-7 N87DX Built, Flown, and Sold! \nClassic Aero Sportsman interior with front carpet. Rocky, I think the -A models have fewer aft CG issues than the taildraggers. I wouldn\'t stress about it. There are many ways to adjust. \nSince I will be installing the landoll ring, I was looking at the data today, my cg moved forward on the conversion. \nThe 12# ring will help, but I will also keep my lead scuba bean bags on my inside firewall. I created a dam to hole them forward. \r\nSince I will be installing the landoll ring, I was looking at the data today, my cg moved forward on the conversion. \r\nThe 12# ring will help, but I will also keep my lead scuba bean bags on my inside firewall. I created a dam to hole them forward. \r\nI\'m about a week away from weighing mine -- taildragger, IO-360-M1B, Hartzell BA, light VFR glass panel, built to plans. Should be interesting. I\'ll post the #\'s when I have them. Interesting indeed. The CG change data is counterintuitive to me. \nOn the assumption that there were not any other items relocated unrelated to the 7A to 7 change, the CG moving forward indicates that the main gear relocation has a major effect on CG position between the 7 and 7A. \nThe nose gear removal and tail wheel addition are both "rearward CG" moves so the main gear repositioning had to more than compensate for both of them. \nI have had recent "idle" thoughts about converting to a 7. It will take a mighty big "round tuit" though. \nWhen I was building 7A 10 years ago, I had seen posts about rear CG tendency but I did not realize it was the taildragger being described. I pushed everything forward during construction and have an empty CG of 78.7" which is quite far forward. It is essentially impossible for me to load the craft out the back of the envelope. Downside is my nosewheel weight is high although still within Vans limits in all loading scenarios. Interesting indeed. The data is counterintuitive to me. \r\nOn the assumption that there were not any other items relocated unrelated to the 7A to 7 change, the CG moving forward indicates that the main gear relocation has a major effect on CG position between the 7 and 7A. \r\nThe nose gear removal and tail wheel addition are both "rearward CG" moves so the main gear repositioning had to more than compensate for both of them. \r\nI have had recent "idle" thoughts about converting to a 7. It will take a mighty big "round tuit" though. \r\nWhen I was building 7A 10 years ago, I had seen posts about rear CG tendency but I did not realize it was the taildragger being described. I pushed everything forward during construction and have an empty CG of 78.7" which is quite far forward. It is essentially impossible for me to load the craft out the back of the envelope. Downside is my nosewheel weight is high although still within Vans limits in all loading scenarios. \r\nTitan IOX370, single G3X touch, whirlwind 200RV constant speed prop, painted. \r\n85 lb baggage capacity with full tanks and the wife and me (320 lbs). Looks like no acro with a passenger though . Oh well! Do not figure baggage allowance with full fuel. You will seldom land with full tanks. Baggage allowance should be calculated with minimum fuel for C/G limits. Do not figure baggage allowance with full fuel. You will seldom land with fuel tanks. Baggage allowance should be calculated with minimum fuel. ... Except for emergency returns. Understand the risk you\'re taking doing this. RV\'s can\'t dump fuel -- unless someone has a crazy mod . My primary concerns are for C/G limits. You are correct that it IS a factor for gross weight. \nC of G = 80.8"
\nPainted and ALL parts fitted. RV-7 Io-360 parallel valve, Whirlwind prop. Classic interior. I installed the landoll ring last weekend.